Wopsa Web Services Review 2019: Is Wopsa Web Services a Good Hosting? Wopsa Web Services is a subsidiary of Cygrids Communications, and it has been in business since 2004. The vendor offers various web hosting-related solutions including shared web hosting, dedicated servers, and domain name registration services, targeting businesses in Sweden and beyond. Wopsa Web Services is a Swedish hosting vendor. 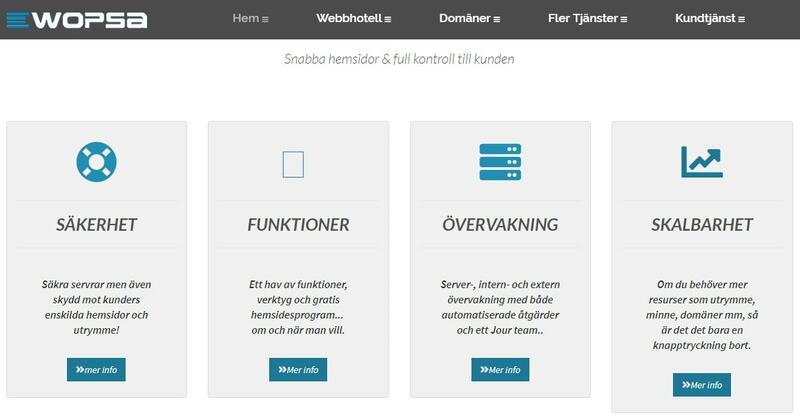 It has been in operation for over 15 years and is ranked among the top 30 web hosting companies in Sweden by market share. The hosting firm is a subsidiary of Cygrids Communications, a turnkey contractor for IT services. Wopsa offers an array of hosting services including shared web hosting, VPS, dedicated servers, SSL certificates, domain name registration, and reseller hosting to its customers in Sweden and beyond. Wopsa houses its servers in Cygrid’s data centers located in Eslöv, Sweden. The vendor uses SSD-based servers with a RAM allocation of 8GB. This enables the vendor to provide extremely fast scratch disks (for frequently accessed data) thereby delivering faster loading speeds for the websites it hosts. Customers of this vendor’s shared hosting solutions can choose from three packages: Budget, Standard, or Professional. The Budget plan is the starter plan and comes with disk space of 2GB, and 10 domains. The Professional hosting plan is the vendor’s most advanced shared hosting plan, and it comes with disk space of 30GB and unlimited domains. Wopsa performs regular backups one to three times every week. It calls these backups “Dalig backup”. In addition, the vendor performs daily backups on its local servers that can easily be accessed via its cPanel control panel. However, the hosting provider encourages its customers to create their own backups on their computers. This is for safer data protection just in case something happens to Wopsa’s backup system. In addition to offering free SSL certificates, Wopsa offers an Extended Validation SSL Certificate package. This is the highest class of SSL certificates available and it activates both the padlock and the green address bar in all major browsers, offering protection from cyber attacks. Wopsa’s hosting plans are quite cheap, especially when you put into account its 50% sign up discount. The prices are listed in Swedish krona and euros. The hosting plans come with flexible monthly billing cycles. What’s more, the vendor offers a 30-day money-back guarantee and its servers provide an excellent uptime of up to 99.99%. Wopsa’s telephone support is available during business hours from 8:00 a.m. – 5:00 p.m. CEST on weekdays. You can also reach out to its customer support desk via email and ticketing system. While the vendor claims to have a live chat, I could not find it on its website. The vendor’s customer support is not available 24/7. I sent a message via this vendor’s ticketing system and received an automated response, the vendor informing me that they had opened a ticket for me. However, the vendor closed the ticket without ever responding to my message. Wopsa has put up a fairly detailed knowledge base for your perusal, as well. With the use of SSD-based servers, Wopsa is able to offer great hosting solutions with extremely fast website loading speeds. The vendor’s budget friendly hosting plans and its 50% sign up discount make it an extremely attractive option for small and medium-sized businesses. That said, the vendor’s habit of closing tickets before addressing the issues its users have raised should concern any would-be customer. Wondering how Wopsa Web Services stacks up against other Web Hosting companies? Enter any other Web Hosting company and we will give you a side-by-side comparison.